Turkey's press is under siege. More than 90% of national media is controlled by pro-government companies. Over 160 journalists are in jail, including 129 as a result of the coup attempt in July 2016. After that date, 54 newspapers were closed – plus 6 news agencies, 24 radio stations, 17 television networks, and 20 magazines. Unfortunately, it seems that public opinion in Europe has become accustomed to such news and has almost accepted that Turkey is turning into an "Islamist Turkmenistan". 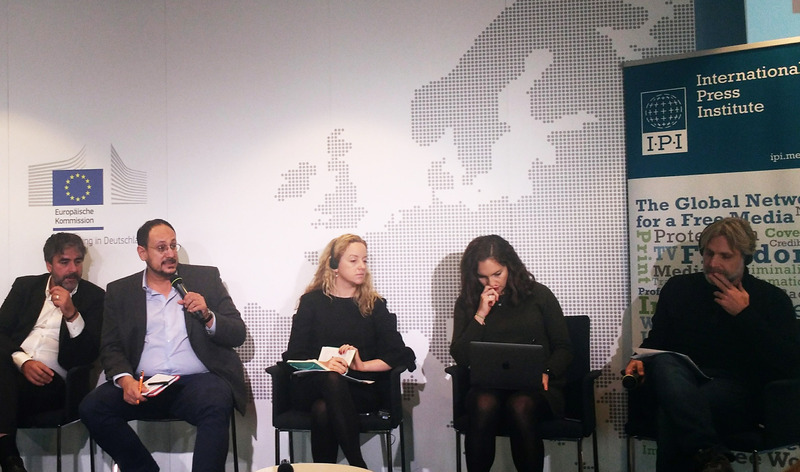 These are the premises and some of the comments emerged from the event organised last Wednesday by the International Press Institute (IPI) in collaboration with German daily WELT in Berlin’s House of the European Union. 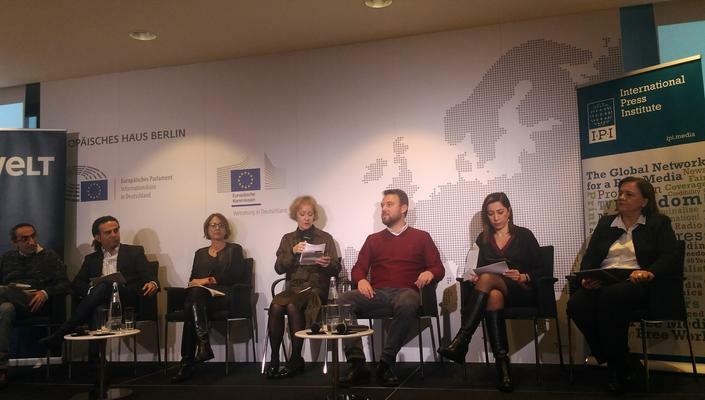 Many leading journalists and jurists took the floor and gave direct testimony to the conditions in which media professionals continue to carry out their work in Turkey, with a stubborn look to the future. In addition to describing the difficulties they face on a daily basis, the debate also focused on Europe's role in defending fundamental rights in Turkey. "Europe must make a decision. It has to decide whether it wants to keep engaging with Turkey or abandon it", said Nevşin Mengü, recently fired after being an anchorwoman at CNN Turkey for several years. "But if it abandons it, it will have to acknowledge that an Islamist Turkmenistan will be at its borders", the journalist added, "and deal with this fact". A coalition of freedom of expression organizations led by the International Press Institute (IPI) launched the “I Subscribe” campaign for independent journalism in Turkey.The campaign encourages readers from around the world to subscribe to Turkey’s Evrensel and Birgün, two of the few remaining independent daily newspapers in Turkey, as a gesture of support. "If this event had been organised two years ago, there would have been many more people than today", was the opening line by Turkish-German journalist Deniz Yücel, released last February from the Turkish prison of Silivri after being held in custody for over a year. The German authorities had taken decisive action for the reporter's release. In the still ongoing trial, the Turkish judiciary has requested up to 18 years in prison. "Turkey is not just any country for Germany. There is no German who has not visited Turkey at least once in their life, who does not have a Turkish friend or neighbour. In addition, Turkey until recently was a country that wanted to join the European Union. This is why the reaction to the country's authoritarian turn in the last 5 years has been stronger here than in other Western European countries", said Yücel. "My arrest has helped increase this attention and my name has become a symbol to talk about the situation of the Turkish press in general. Unfortunately, however, when I stopped being a symbol – because I was released – the interest of the public fell too". Yücel brought the example of Turkish-German online newspaper TAZ , founded 2 years ago and entirely supported by readers' subscriptions. "We note that this year the amount necessary to support editorial activities is being reached with great difficulty, unlike in past years. Unfortunately, this is a sign that both the public and the German government are getting used to the idea that Turkey is a lost cause". Fatih Polat, editor of the independent newspaper Evrensel, reminded how important the presence of international observers is to the processes that affect colleagues every day. "Solidarity influences the attitude of judges in the courtroom. When there are external observers, they feel compelled to explain the decisions. In one of the trials I have witnessed, the judge even pointed out that 'the trial was followed by public opinion'". An important act of solidarity is the subscription campaign just launched by IPI to support Evrensel and BirGün, among the few independent newspapers left in the Turkish media landscape. Nurcan Baysal, human rights activist and Kurdish journalist, explained how much more difficult it is to be able to do her job in the south-eastern provinces with a Kurdish majority. "Here journalists' activities are shaped by the wars and clashes that take place in the region. After the peace process was interrupted in 2015, journalism has increasingly been associated with terrorism", the journalist said. Baysal herself was detained for tweeting against the Turkish army's intervention in Afrin earlier this year. "I know for sure that at Diyarbakır's attorney office there is a person tasked with monitoring my activities on social media", adds the activist, who stresses that she was only released "thanks to the sensation stirred in Europe by my arrest" . Journalist Mehveş Evin, who after a long career at mainstream newspaper Milliyet works for the portals Artı Gerçek and Yeni Yaşam, explains that even small, symbolic gestures of support can influence the morale of journalists in jail, letting them know – and those who keep them imprisoned – that they are not alone. "Sending books or letters is a very good way to demonstrate this support". According to Fatih Polat, what Turkey needs is financial support that does not damage the profession's ethics, but is above all support to the democratic culture of the country as a whole. A coalition of freedom of expression organizations led by the International Press Institute (IPI) launched the “I Subscribe” campaign for independent journalism in Turkey.